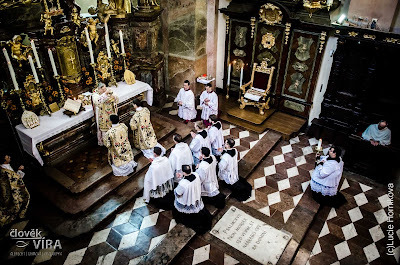 The reactions to my article of two weeks ago (“A Defense of Liturgy as ‘Carolingian Court Ritual’”) displayed a wide range of opinions on the “baroque” or “rococo” aspects of the Tridentine Roman liturgy. Some even suggested that the difference between medieval rites and the Tridentine rite is that in the former, the focus remains on God throughout, with the ministers merely having various jobs to perform in carrying out the work, while in the latter, the focus shifts to everyone paying homage to the celebrant. I think this is a crucial issue that deserves further thought, as it exposes foundational questions about the iconicity or representationalism of the liturgy. What I argued about the cappa magna may be extended to all the aspects of the greatest of historic Latin liturgies after the Papal Mass, namely, the Pontifical Mass. This liturgy features elaborate pre- and post-ceremonies of divesting and vesting, in addition to special touches throughout the Mass bound up with the episcopal standing of the celebrant. How we should understand these things may be gathered from a luminous statement in the Holy Rule of St. Benedict: “Let the abbot, since he is believed to hold the place of Christ, be called Lord and Abbot, not for any pretensions of his own, but for the honour and love of Christ.” As with the abbot, so with the sacerdos magnus: all attentions are being given to Christ, who is present in a special way in His ordained ministers. For our Lord could have said of His animate instruments just what He said of the poor, with no less truth: “Whatsoever you do to the least of my pontiffs, that you do unto Me.” And we know that “he who honoureth not the Son, honoureth not the Father, who hath sent him” (Jn 5:23). With the widespread loss of faith in the Real Presence of Christ in the Holy Eucharist, we lose our faith in His real presence in the priests; religious exercises come to be about us, about the community. Naturally, in this false perspective, it is absurd to wear beautiful vestments, much less a cappa magna — who are we to dress up like this? But it is not about us; it is all about Jesus, directed to His honor and reflective of His glory. How would we treat Our Lord if He were the one offering the High Mass? Yet He is the one offering it; the Eternal High Priest is present in and working through His earthly high priest, whom we confess to be alter Christus. No one has been granted the privilege of seeing this truth more fully than St. Gertrude the Great, who beheld in many of her visions the Lord Jesus Himself celebrating the liturgy of the Mass and of the Divine Office, with hosts of angels as his acolytes. And our Lord communicated Himself to her with a love and tenderness which no human tongue could describe, so that she received the perfect fruit of His most precious Body and Blood. After this He sang a canticle of love for her and declared to her that had this union of Himself with her been the sole fruit of His labors, sorrows, and Passion, He would have been fully satisfied. Admittedly, Gertrude was caught up in rapture and saw visions that are seldom granted to mortals. 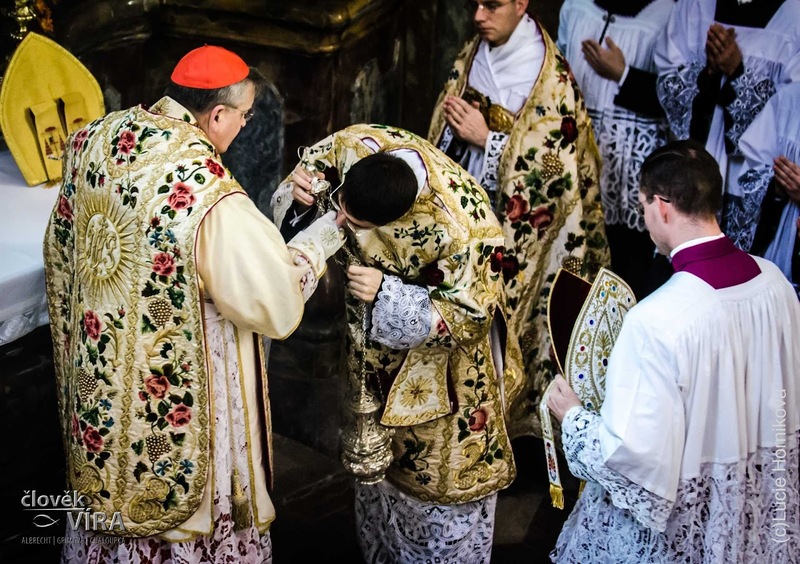 Nevertheless, a Pontifical Mass truly does convey something of the burning intensity, the royal majesty, the celestial beauty, the overwhelming holiness of the Mass of Our Lord that she beheld. If our Mass on earth does not hint at this, if it is not capable of being a springboard to mystical communion with the High Priest, if it is antithetical to the truth Gertrude saw momentarily unveiled, it is being false to its essence. I remember with great inner warmth how it felt to be at the Mass celebrated by His Eminence Raymond Leo Cardinal Burke at Strahov Abbey on the Feast of St. Teresa of Jesus in October 2016. Between the sanctuary full of ministers going about their many and varied tasks of service and the choir loft whence flowed the milk of chant and the honey of polyphony, I was suspended in an enormous net of prayer, the Church in heaven and the Church on earth, into which I, though unworthy, was invited to participate, along with the hundreds of souls packed into the narrow wooden benches of the nave. Prayer was not a mental construct but a pulsing, palpable thing going on above me, before me, and yet within me, something much greater and more real than myself in that it came from God and carried me to God, infusing a sense of wonder and humility. “Who am I, that the mother of my Lord should come to me?” — this mother that the liturgy is for our spiritual life. The two hours of the Pontifical Mass passed as quickly as if time had stepped aside in deference to its master, waiting to be summoned again when he should wish it. The liturgy ended with a monumental improvisation on the pipe organ, so that my last impressions were an anarchic blend of banners carried in procession, music seizing hold of all space, and the bustle of men, women, and children streaming forth to the courtyard. I had been present at the tearing of the veil in the temple, the veil of His flesh, and for a moment the heavens were opened. I had worshiped with the angels, knelt with sinners, felt the balm of beauty, tasted the sacrament of love. Never have I been more proud to be a Catholic — or more aware of my smallness and dependency, my unworthiness as a member of the Mystical Body. From those heights, let us return once more to pontifical regalia and look at the question from the opposite angle. While it is sometimes possible that a saintly priest or bishop would choose to rid himself of anything valuable in order to give the money to the poor, in our own times it is much more common to encounter what might be called “ostentatious bad taste” or “hypocritical poverty,” when a priest or bishop who claims to be renouncing pomp and circumstance for the sake of the Gospel is really drawing attention to himself as a paragon of social justice, whose ugly garments or clumsy chalices in fact still cost a great deal of money — money that could have been spent on something truly beautiful, which spiritually enriches all who behold it, including the poor. We could put it this way: a priest or bishop who does not see himself as essentially a symbol of another and therefore as able to accept and promote liturgical beauty for the sake of that other will, perforce, see himself as —himself, in front of the people, on display. At this point, two roads are open to him: to be ostentatiously wealthy for the sake of worldly glory, or to be ostentatiously poor and virtuous. In either case, it’s all about him, and the result is thoroughly disedifying. In contrast, when a man of God really acts and speaks as a man of God, one who totally belongs to Christ the Eternal High Priest, it is extremely edifying to see him robed in splendor, uplifted in honor. When Our Lord said: “Whatsoever you do to the least, you do unto Me” (cf. Mt 25:40), He was certainly not excluding the truth that whatsoever you do to the greatest, you do to Him as well. We can see in the simplicity of St. Benedict’s faith the reason why so many in the Church today object to “pomp and splendor” — namely, their lack of the same faith. “Let the abbot, since he is believed to hold the place of Christ, be called Lord and Abbot…” If one does not believe firmly and unshakably with one’s mind and heart that the ministerial priest is alter Christus, a priest forever according to the order of Melchizedek; if one does not believe that the bishop is Christ as ruling, teaching, and sanctifying; if one does not believe that the hierarchs of the Church are the authoritative voice and healing hands of the Word made flesh, the King of Kings and Lord of Lords who suffered and is now exalted gloriously in heaven above the cherubim and seraphim, then it is perfectly reasonable to be repelled by signs of pomp and splendor. The generation of westerners of which he [Francis] is a part was marked — in Church, State, and indeed, in every field — by what can only be called a sort of “personalization” of authority. That is to say, that the traditional division in perception between an office and the current holder of that office — which allowed people of wildly differing, sometimes even opposed, views to collaborate out of shared respect for the office under whose direction they functioned — has been blurred or even obliterated. Such folk, when in authority, tend to downgrade or do away with traditional symbols of their office while emphasizing their own personalities in pursuit of some nebulous “authenticity.” So it is that morning dress and uniforms disappear from presidential inaugurations and legislative openings, and royals love to appear in casual wear. The difficulty with such an approach is that it tends to weaken respect for the office in the eyes of its subjects, who in turn begin to believe that their loyalty to it is dependent purely on their personal feelings for the occupant of the moment. Seeing the problems this had created, Benedict XVI began to restore the symbolic side of the Papacy, for all that formalism and display ran extremely counter to his nature. But it is not an issue that one of Francis’s generation could be expected to understand — quite the contrary. What is certain is that he did try to use the hermeneutic of reform himself. Despite the lack of tiara noted earlier, piece by piece he restored bits of the papal wardrobe that his immediate predecessors had discarded: the fur-lined mozzetta, the camauro, the fanon, and — most annoying to some — the traditional red shoes, symbolizing the fact that as Pope he walked in the footsteps of the martyrs. This humble Bavarian who shied away from the limelight saw that paradoxically it was necessary to elevate and accentuate the sacramental iconicity of the pontiff in order to move beyond the cult of personality inadvertently started by John XXIII and vastly augmented in the charismatic athlete, actor, poet, and playwright John Paul II. With Pope Francis, we see a return both of the cult of personality and of the false conception of poverty, this time applied not only to liturgy but also to doctrine itself. When we look back over the criticisms made of episcopal vestments by certain fathers of the Second Vatican Council and by our minimalists of today, we must ask ourselves: Why would a bishop who protests about wearing gauntlets or buskins not likewise protest about the mitre and crook? Why is a bishop or a priest still wearing clerical attire of any sort? Did not the chasuble begin as a typical Roman garment, of which jeans and a T-shirt would be our equivalent? Why is a cleric still using prescribed rituals and ceremonies at all? Joseph Ratzinger saw that the post-modern critique of structures and institutions extends to everything — there is no logical reason to stop at the cappa magna or the gold chalice or the medieval chant, as opposed to carrying the deconstruction of religion all the way to its entire visible material system of power. For this reason, therefore, the post-modern critique has to be rejected at its root. In its place we must put the Pseudo-Dionysian principle of excess, even super-excess. While we may not prefer the results of the Baroque aesthetic to those of the Byzantine, the Romanesque, or the Gothic, we can recognize in it the Christ-loving, creation-loving exultation of the Catholic soul, which serves as an antidote to the poisonous reductionism of our time and an exemplar of the disciplined abandon to holy things, rejoicing in every pound of spikenard it can spill out to anoint the feet of the Lord. Holy Rule, ch. 63 (McCann trans.). Perhaps the most astonishing example of Benedict's analogical thinking is found in ch. 7, under the fifth degree of humility. The chapter begins: "The fifth degree of humility is that he [the monk] humbly confess and conceal not from his abbot any evil thoughts that enter his heart, and any secret sins that he has committed." Straightforward. But then Benedict backs up this advice with three authorities: "To this does Scripture exhort us, saying: Make known thy way unto the Lord and hope in him. And again: Confess to the Lord, for he is good, and his mercy endureth for ever. And further: I have made known my sin to thee, and my faults I have not concealed. I said: I will be my own accuser and confess my faults to the Lord, and with that thou didst remit the guilt of my sin." The patriarch has virtually equated "confessing to the Lord" with "confessing to the abbot." This can make sense only because the abbot is a true and authoritative 'icon' of the Lord, an alter Christus, along the lines of Jesus' statement: "He who hears you, hears me." William J. Doheny, C.S.C., The Revelations of Saint Gertrude, Part III, ch. LXI. It was thought that hardly anyone would come to this Mass. When it began, the church was so full that no seats were left and latercomers had to stand or sit wherever they could. It is doubtful that this abbey has seen so many worshipers for a very long time. It is almost always this way with Pontifical Masses: the People of God are famished and they come to the feast whenever and wherever it is set forth. Vicars of Christ: A History of the Popes (Arcadia: Tumblar House, 2014), 389–90. By “poverty of doctrine” I refer to the superficiality, messiness, ambiguities, contradictions, and unclarity of this pope’s teaching, in contrast to the rich truthfulness of those of his predecessors who took seriously the Lord’s command to “let what you say be simply ‘yes’ or ‘no’” (Mt 5:37); cf. 2 Cor 1:17–19, Jas 5:12. For more thoughts about the deconstruction of symbolism, see the superb recent article on Alfred Lorenzer's 1981 study The Council of the Bookkeepers.